This guide assumes that you already know the basics of live streaming. For example, this assumes you know that you will need a camera and encoder. From that starting point, we will provide a walkthrough on how to setup a live channel and begin streaming using DaCast. Still need help with the basics? Check out this basic guide first! If you’re interesting in setting up your account in the new DaCast BackOffice, we also have a guide for that here. Let’s Get Started with Live Streaming! 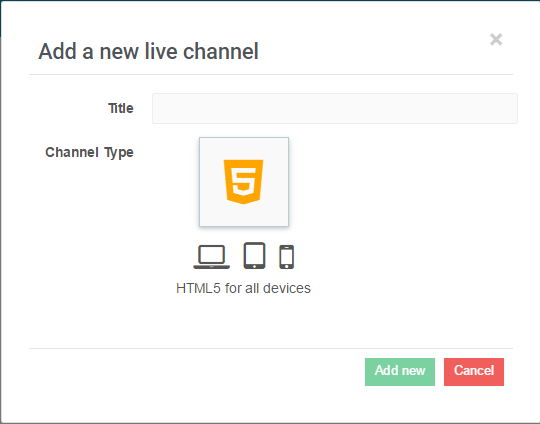 To begin live streaming through your own channel, you first need to login to your DaCast account and make sure you are in the Live Channels section. After logging in, please click on the orange “CREATE” button located on the top right of the page. Once you click the “Create” button, the following window will pop-up, allowing you to name your new live channel. After you have named your new live channel, you click on the green “Add New” button. By default, streams are HTML5-based for all devices. If you need to use a low latency channel or a m3u8 channel to stream to Roku TV or integrate your stream in a mobile app, contact us. This is the first area you should see after you’ve created your new channel. Please note that your live channel is turned OFF by default. You can turn it ON whenever you want to put your channel online. The rest of the settings are optional. Category, Description and Splash screen relate to how the content will be shared on the DaCast Viewer Portal. If you plan to only share the content on your own site, these settings can be ignored. However, please note that if you want your content to be displayed on the DaCast Viewer Portal, you will need to add a description and splash screen. The splash screen will display when content is offline for live streams, whereas the thumbnail is used to represent your content inside packages and on the viewer portal. Please click “SAVE” once your information has been entered. The second step in this process involves the publish settings, which control embeds and advanced features. Advanced features include geographic and website restriction. Player themes are also selected here, and autoplay can be turned on or off here, as well as accessing the viewer counter, Google Analytics tracking, and publication on the DaCast portal. Our system auto-detects and optimizes the selection of the publishing point based on the location of your stream. Please note that DaCast does not support adaptative live transcoding for now but soon will! Right now it uses a multi-bitrate method for live video wherein the broadcaster can setup several different qualities to stream at. Our player is adaptive and automatically detects your encoder multi-bitrate settings to provide the best quality stream to your viewers based upon their connections. OBS Studio: an open broadcaster software that you can use to freely and easily set up your stream. Please be aware that OBS studio does not support multi-bitrate. Other RTMP Encoders: you are free to use any hardware or software encoders with DaCast as long as they are RTMP-based. Now for the most extensive part of the process, which is linking your DaCast account to your encoder. You fill find the information needed to do that and the process might be different according to the encoder you use. – Stream URL and Stream names that are always needed. If you are having trouble using the Stream URL you might use the Backup URL. NOTE: M3U8 and low latency channels do not have a Backup URL. – Login and Password are needed when DaCast is not integrated in the dropdown menu of the encoder. This area gives you the possibility to set up a paywall for your live channel so viewers will have to get through pay-per-view before getting access to your content. Please note that you can also set up promo code to offer discounts to your viewers. This section will give you the usage and performance of your live stream. In order to stream yourself, would you have to start it or can someone else have the play button? As in, can others watch via Dacast and it be broadcasted to the whole internet without your knowledge? If your encoder is ON, launched from your computer (and this will have to be running from where you are) – anyone that has the credentials of your DaCast account can launch the streaming flux. So it is possible, if you were to give your credentials to someone, that he could start a Streaming without your knowledge, but it would also require that your encoder is running at that moment, and this has to be done willingly. Just to understand, is it for a project you have or for security concerns?